Few months back I was in Rajasthan and I was inspired to write this small article dedicating to all those following simplicity diet. I am sure those who visit villages in Rajasthan get the same feeling. In comparison to villages in other parts of India, Rajasthani villages are special. Rajasthani men and women are semblem of simplicity. And it starts with their diet. UNDOING THE CONDITIONING: I happenned to understand that unless we simplify our dietary habits, it is not possible to achieve self-sufficiency in our village community projects and it is not possible to become simple. Our conditioning with opulent food that comes from three thousand different destinations is what we look to replicate in our agricultural practices. Even if by some intelligent arrangement if this is possible, we loose the purpose – the simplicity. How much true is Srila Prabhupada’s statement – “Use ONLY what you produce, produce ONLY what you need”! Our conditioning, thanks to “Green revolution” and other ongoing efforts by corporates and corrupt governments combined, is due to brainwashing about nutrition, diet and supplements. But when we go back to nature, everything makes sense. The first thing to do is willing to simplify our diet. Simplifying our diet has a rippling effect. It affects all the other aspects of life; not just health, but everything from food preparation, food storage, fuel consumption, kitchen design, the amount of money we may require, the kind of clothes we need, medical bills, transportation expenses, time spent away from home – it’s totally mind boggling when we realize how everything links back to our food choices. Simplifying food habit means to just make nutritionally enough of food that we consume to keep the body and soul together. What we will need is nutrituous food and very little of it at regulated time. The problem today is not wholesome food, too much of it and at unregulated time. It is expensive too! It is difficult to grow and process! It’s time to get to simplicity basics. Let us make no mistake. Foods that are available today, including milk and its products, are highly and abominably adulterated. They are there to make profits. Apart from the high pesticide content in the food they are not nutritious. BREAKING THE NUTRITION MYTH: Nutrition value does not lie in the food that we eat. Today, nutritionists increasingly recognize that vitamins, proteins, etc., are just fragmented compounds, not whole foods. The body does not recognize vitamins as food. According to ayurveda, the natural and wholesome lactovegetarian food offerred to the jatharagni (fire of digestion represeting Supreme lord) consumes the food to provide required nutrition for the body. Nutritious food is that which has not been tampered with in any way. It has not been processed, bottled, boxed, frozen, canned, heat-treated, preserved, electrocuted, injected with hormones or anti-biotics, sprayed, colored, thickened, pasteurized, defoliated, fumigated, radiated, gassed, waxed, stamped, stapled or whatever. So what does that leave? It leaves only basic, whole foods, such as brown rice, whole wheat, millet, oats, buckwheat, organic fruit, organic vegetables, nuts, leafy green vegetables and herbs, milk and its products. That’s about it. Raw food is simply that which keeps the nutrition intact. Ayurveda recommends a balanced diet. Diet is balanced if it contains six types of tastes – madhu, katva, amla, lavana, tikta and kasaya. Also, four types of food – carvya, cusya, lehya and peya-prasada that is chewed, prasada that is licked, prasada tasted with the tongue, and prasada that is drunk. The best way to eat is more percentage of whole raw foods than cooked. Raw foods satisfy hunger and so we need less! So simple diet will also help us eat frugally because it is nutritionally fulfilling. Hari Bhakti Vilasa also gives detailed steps to honour prasada. First one must taste sweet a little bit and then start with other food. The food should end with buttermilk (unlike sweet that we usually do). This method also establishes complete nutrition to the body. One must also sip water little during honouring the prasada. However, one should not drink water just before beginning or at the end of prasada. This will destroy the fire in the stomach. One must say prayers or atleast chant Hare Krsna Maha Mantra before and after the prasada. However at the end one must rub the belly while saying the prayers. Also, before one honours prasada, one must clean their feet, hands and face. Sitting on the ground or squatting is best to honour prasada and not on the chairs and dining table. This sitting position helps to sense whether our stomach is full or not. Else, we may overeat. Eating just right and frugally is the key for simplicity. With this formula we do not even waste Krsna prasada. EATING FRUGALLY – MILLETS THE MAGIC FOOD: To practice any kind of yoga, there is no other way than to adopt to simplicity dietary habit. Because practising yoga means to control senses starting with the tongue. Therefore, eating less and fasting are two very important processes. Eating once or twice is best to practice yoga. Also, eating frugally is intimately connected to keeping purity of thought and cleanliness outside. Overeating causes problems such as “amla pitta” or acidity. While not eating at all might cause ulcers. Eating light and right is what we can define as frugal diet. Millets are magic food. There are around 7000 millets reported all over the world. Before green revolution, the staple diet for Indians was millets and less of rice or wheat. Bajra for example is widely used in Rajasthan even today. Bajra roti and butter twice a day forms their diet. People still work hard in the fields and ksatriyas fight hard on the battlefield. Ragi for example is a magic wholesome food. In south India, farmers work whole day with one ragi ball and little ghee and rasam. Growing these millets are very easy too. They are disease resistant unlike cereals like rice and wheat. Hence they do not require any pesticide. For unknown reasons, GMO companies have not bothered to tamper with them as yet. So original seeds are still available. Paleoethnobotanists note that millet based diet was prevalent all over the world some 100 years back. Our food today is poisonous. Ayurveda recommends to make our food as medicine. 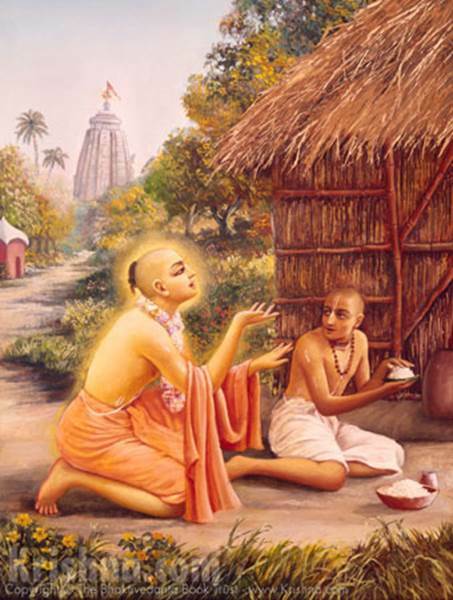 Turning to wholesome, natural, organic, lacto vegetarian and home grown food offerred with love to Krsna and consumed frugally at regular time is what I want to do as a noble son of Srila Prabhupada for simple living – high thinking.